One of the most wonderful things about being back, is of course catching up with everyone I've missed. And where do most of my friends congregate? At a drag competition of course! My friend Shane (aka: Megan M'Dei) is taking part for the second year in Drag Idol 2013 in Newcastle, so I got dolled up to see him perform an Anne Hathaway inspired number (video at the bottom). I did end up selling the majority of my party dresses and heels on eBay before I went backpacking, but a few weeks ago Simply Be sent me this amazing dress which is one of my new favourites. I think the fascinator makes me look more like I'm either heading to the races, or dressed as an elaborately wrapped gift for a costume party. 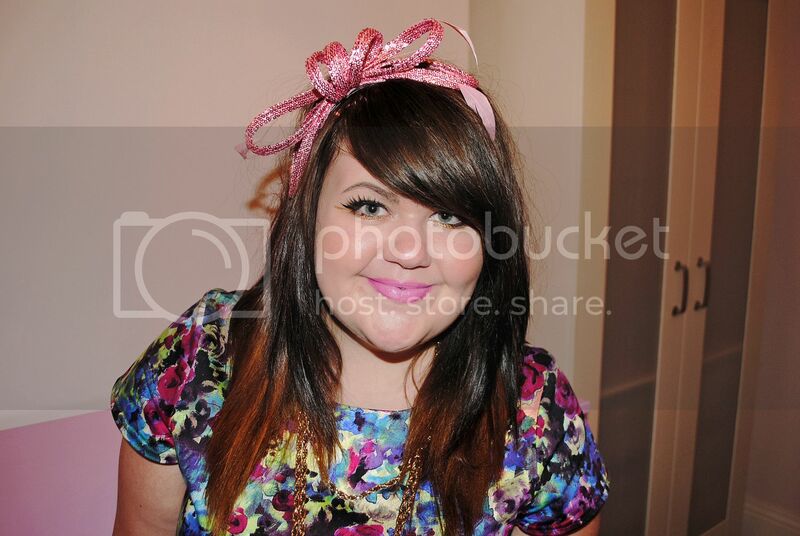 But if you can wear a ridiculous big bow with feathers on your head anywhere, it's Rusty's in Newcastle. Believe me, I was underdressed there. The dress is absolutely lovely, although I believe it's currently sold out online - however there is something very similar in the same shape here and here (if you prefer long sleeves). As always with Simply Be, I recommend sizing down a little as it is always a generous fit, especially with the elastane. Between last weekend being spent in Glasgow with my sister eating lots of delicious food and drinking uhhmazing cocktails (one was served in a vintage cup!) and job hunting I haven't a lot of spare money to spend on 'frivolous' things, as I'm currently living off my savings. However, when I saw via Claire and Maria that Fragrance Direct was having a 50%+ off sale, I couldn't resist treating myself. Plus the top four drawers in my new chest are supposed to be filled with makeup. Surely it's bad karma not to treat them to new things, right? Right. I got everything here for under £20 including p&p. Not bad, eh? So in doing my makeup I used a combination of old and new favourites. Mel tweeted the other day that nothing makes her happier than a new clothes day. I completely agree, but a 'new makeup day' comes a close second. I'm absolutely thrilled with the Dainty Doll products. I've tried them before, but the shades I bought were too light for me and so got bequeathed to my sister who is more porcelain. However with the prices being £3 and under, it was worth another go and I love everything so much. Rimmel 'Wake Me Up' already has teeny tiny little specks of sparkle in the formula, which some people love and some people hate. I personally think it really makes your skin look amazing in photos, especially with the Dainty Doll mineral powder on top. It keeps you looking rather dewy, but very photo ready. I think in the picture, my skin actually looks a little photoshopped - but honestly, apart from dodging the colour and adjusting the lighting and contrast I haven't touched anything else! I also bought a lipstick and eyeliner from the range, which I've tried already and are wonderful to wear (the lipstick in particular is so moisturising!) but you'll probably see them cropping up in another blog post. 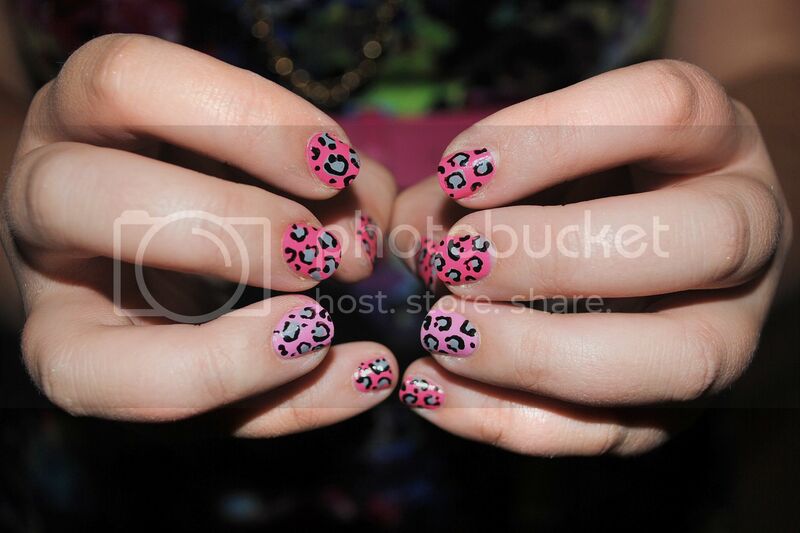 I also did my nails in leopard print again. I sadly was not blessed with a steady hand, and am a little impatient for nail art. But if I have a spare hour or so and a few episodes of Buffy to get through, I'll give it a whirl. Off the Shoulder and Cascade Cool (ring fingers) by Essie, with Grey Matter by Rimmel and Model's Own Nail Art Pen. My sister collects Essie polishes and as they were going for around £2 each I couldn't resist trying them. So far, they seem to be very chip resistant with only my thumbnails coming away at the tips a few days later. Righty-O so be sure to check out the Fragrance Direct website for some bargains. And finally, if you would like to watch the drag show I went to (it was musical theatre week, if it couldn't get any more perfect) you can clicky-clicky below. Go Megan! Go Megan! Muchos love, MessyCarla PS: OH, I almost forgot to wish a Happy St Patrick's Day to my Irish followers. I'm sadly not out tonight (and missing the St Patrick's theme of Drag Idol, le sob) but hope you'll all have a Guinness or three for me. Cheers! Love this, i really want a belt like this. Guh! I am not a florals person, at all, but the colours! Look at all the pretty colours! The colours in that dress REALLY suit you! Glad to see you back on the blog. I missed your posts! Such a pretty outfit and the drawers are great too, did you paint them? 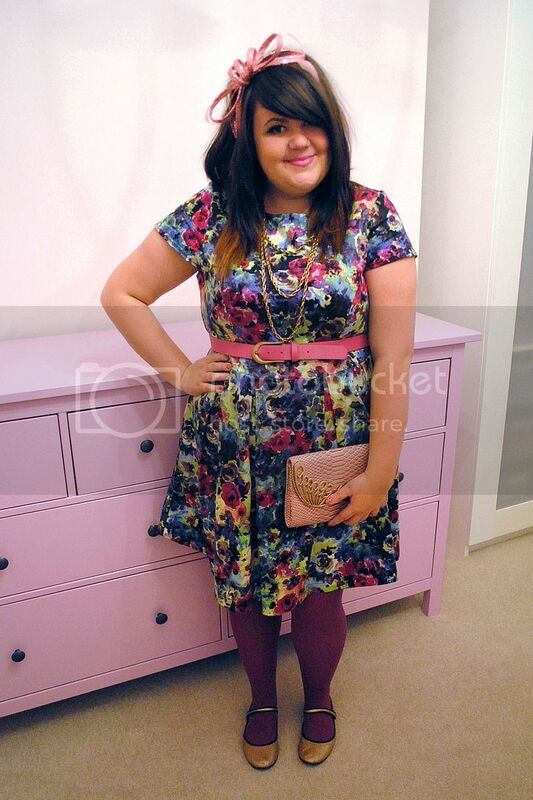 Looking fab, that dress is such a lovely combination of colours, and that dresser - WOW! 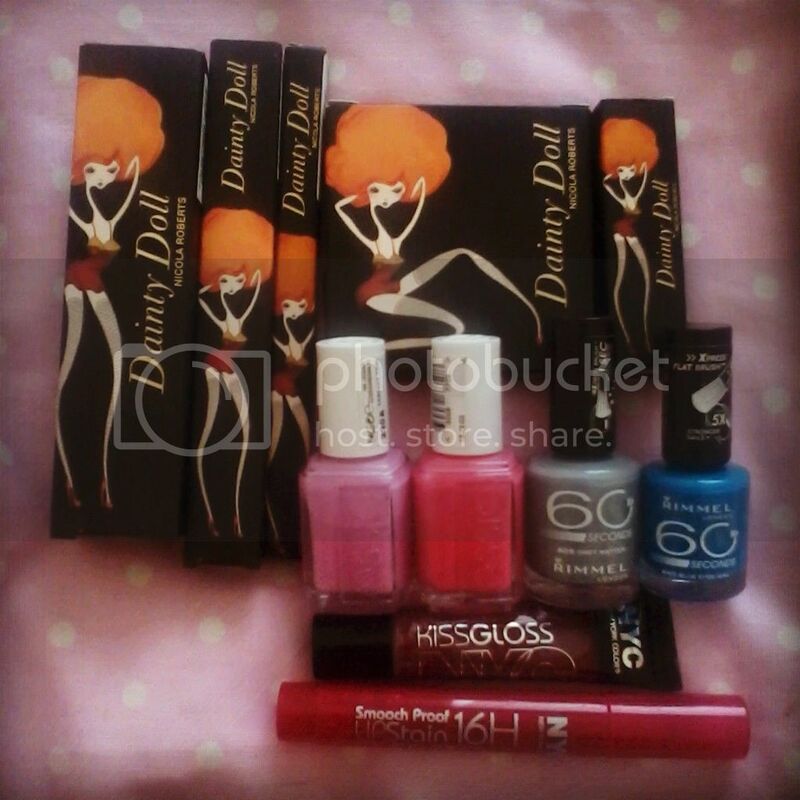 I love Dainty Doll, I swear by their foundations and have quite a lot of their other products, it's all fab! Yay glad to see you back, that dress is lovely and I WANT those drawers! Glad you treated yourself to some goodies too, I was so excited when my box of goodies turned up!